You can allow your to access your folders on Yandex.Disk. When they gain access to your shared folder, they will see a copy of the shared folder on their Disk. When you make changes to a shared folder, such as renaming, adding or commenting a file, all the authorized users see your changes. Information about the changes is also displayed in History on their Disk. If you give users full access to a folder, they can also modify your files and upload new ones. This allows you to work on the same data together. Note. You can create 50 public folders and accept an invitation to 50 folders of other users. Do other people's folders occupy space in my Disk? How to access a shared folder quickly? Choose the folder and click → Shared access on the top panel or in the context menu. To share a folder with a desktop “Yandex.Disk” program, right-click the folder and choose Yandex.Disk: Configure shared access. Is located in a shared folder. Choose the colleagues or teams from the list or enter the address manually. To access the folder, you need a Yandex account. If the invited person doesn't have an account, we will send them an invitation to register. Choose the access rights and click the Invite button. Note. If you see an error message when sending an invitation, make sure that there are no errors or typos in the invited person's address. Read-only — Permission to view and download files from the shared folder. Full access — Permission to upload new files, modify existing files (rename, edit, publish), and delete them. All participants can comment on files in the shared folder, regardless of their access rights. You cannot set custom access to individual files or subfolders within a shared folder. Authorized users lose access to a file in a shared folder if the owner or someone with full access rights deletes the file, or moves it to a private folder. To see who has access to the folder, choose the folder and click → Configure access on the top panel. In the window that opens, the users with access rights are marked with the icon. Revoke access from participants (a copy of your folder will be removed from their Disk). 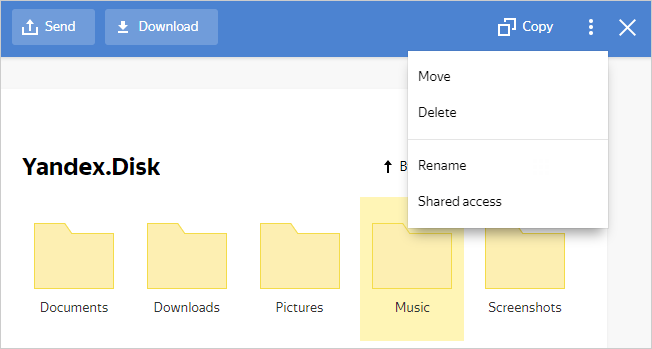 New access rights will immediately and automatically take effect with users of a shared folder. No, a shared folder takes space only on its owner's Disk. Once you accept the invitation, the service copies the folder to your Disk, but space occupied by the folder isn't counted. This means you can accept an invitation to access a folder of any size, regardless of the space available on your Disk. You can see the list of folders that you have granted or gained access to on the Shared folders page. Each shared folder is marked with the icon. 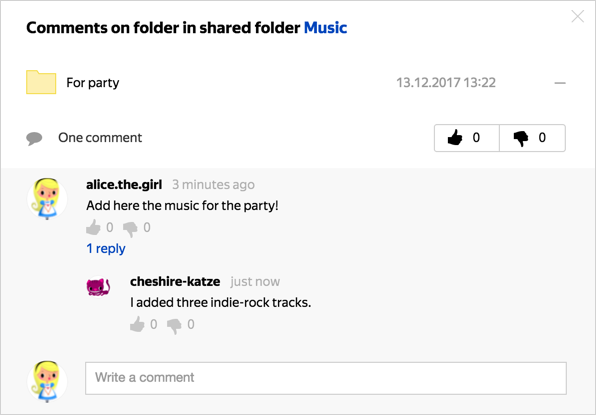 Users with access to a shared folder can leave comments to its files and folders, reply to comments and add Likes or Dislikes. All authorized users can comment, regardless of their access rights. Select the shared folder or a file in the shared folder. In the upper panel, click the icon and choose the Write a comment line. You can't edit a published comment, but you can delete it and write a new one. The owner of a shared folder can delete comments from all members. You will see a pop-up notification in the upper right corner of the screen. The information about the comment is displayed in the notification list. If you have Yandex.Disk installed, you will see a message in the lower right corner of the screen. To view all notifications, click the icon to the left of the account portrait. Click the icon to the left of the portrait. Click the icon in the upper left corner of the window and turn off the appropriate options. To view the history of comments as well as LikesandDislikes, on the History page, click the All events button and choose the line.